For the most part, we eat a very healthy diet. We try to incorporate the appropriate mix of fruits, vegetables, proteins, and whole grains on a day-to-day basis. But we can’t be good all of the time, and football season is the perfect excuse to be naughty! If you follow my blog regularly, you know that all things spicy are my friend. That being the case, Evan suggested that I use capicola instead of ham to add a little zing. I’d say he was spot on with that suggestion! I made half of my rolls with regular dill pickle spears and the other half with spicy spears. I love recipes that only have a few ingredients. All you’ll need is room temperature cream cheese, sliced capicola, dill pickle spears, and egg roll wrappers. Don’t forget oil for frying! Cover the bottom of a non-stick skillet with about half an inch of cooking oil (I used canola). It has a nice, light flavor that won’t overpower the egg rolls. Warm the pan over medium-high heat. Spread a thin layer of cream cheese over a slice of capicola. 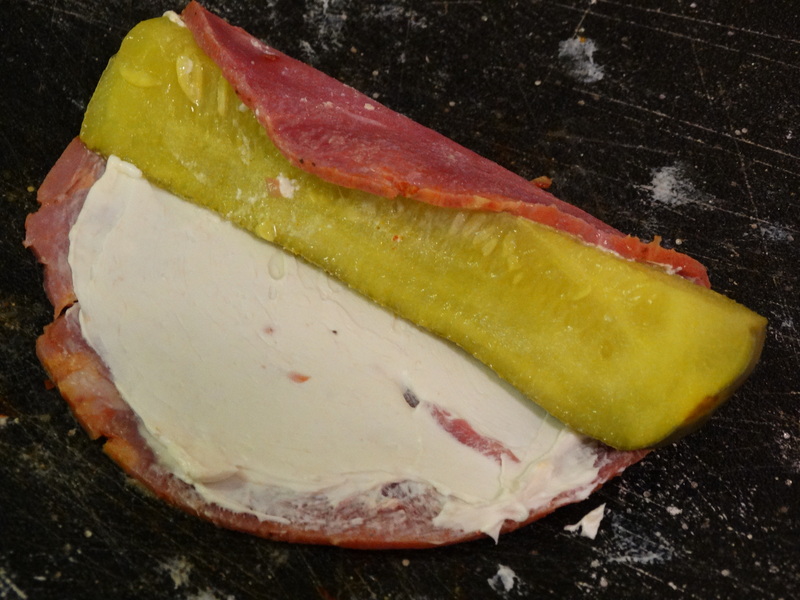 Add a pickle spear and roll into a little log of deliciousness. 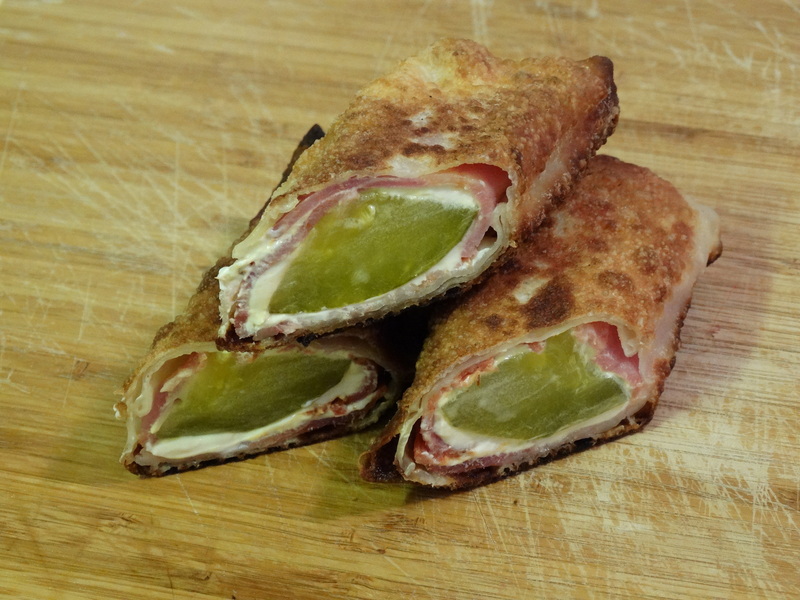 Place your pickle roll on a single egg roll wrapper diagonally. First tuck in the ends, then wrap the sides, the same way you would wrap a burrito. Viola! 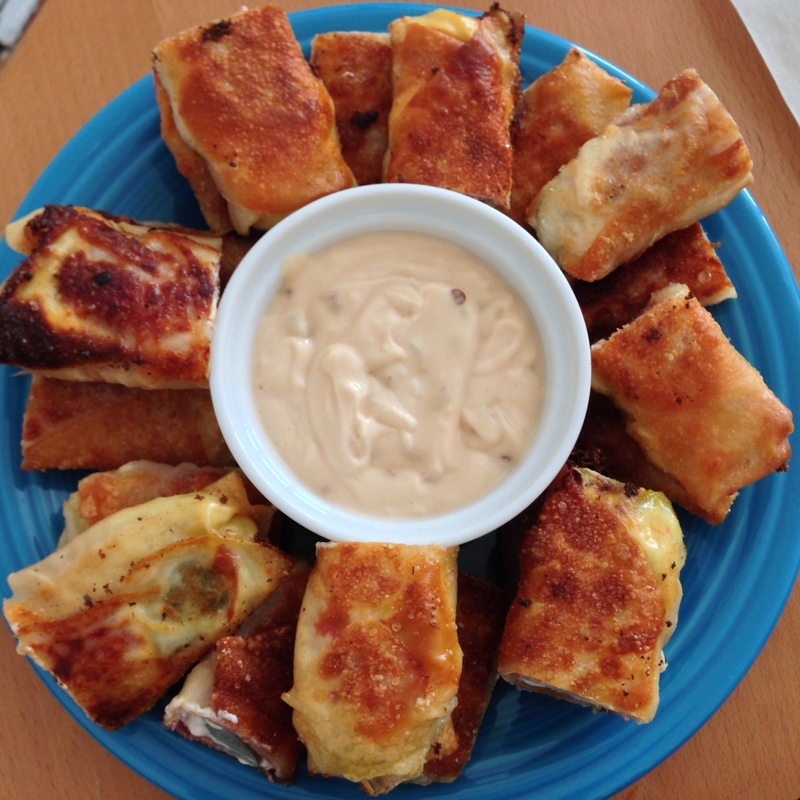 Now you have an egg roll filled with amazing flavors. Repeat until you have your desired number of egg rolls. Once your oil is hot, add several egg rolls to your pan. Make sure to give them some room for cooking. I made 10 egg rolls, cooking them in 2 batches of 5. Fry on one side until crisp, then flip each egg roll and fry the other side. BE CAREFUL! The oil is hot and will splatter. I definitely recommend using long tongs and a splatter screen. 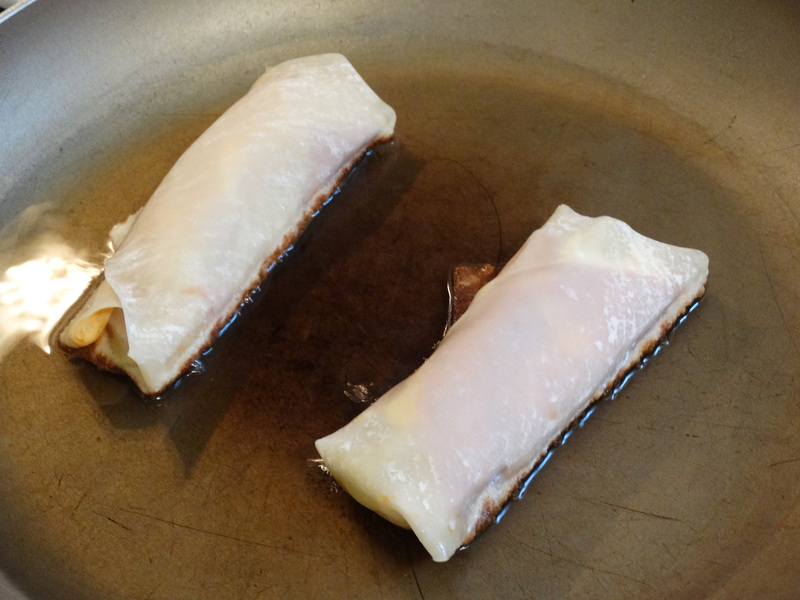 When both sides are nice and crispy, remove the egg rolls from your pan and place them on paper towel to cool. This will also absorb any excess oil. This recipe is a definite crowd-pleaser. 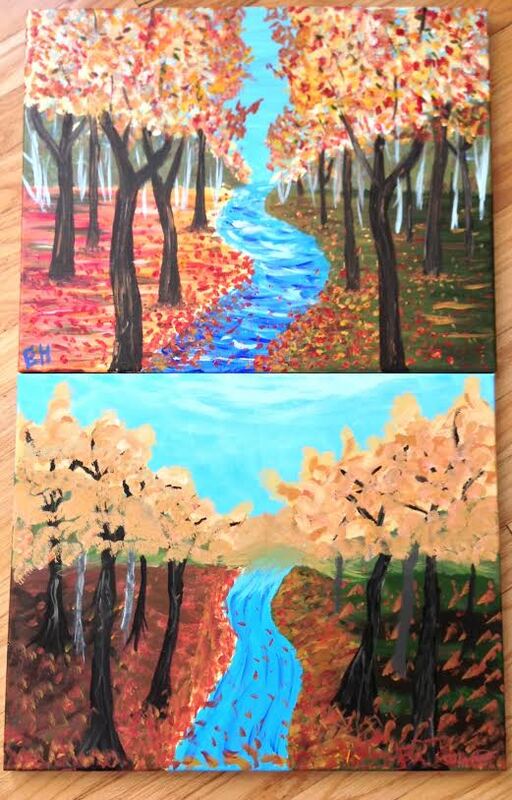 Give it a try this Sunday and enjoy! 1) Cover the bottom of a non-stick skillet with about half an inch of cooking oil. 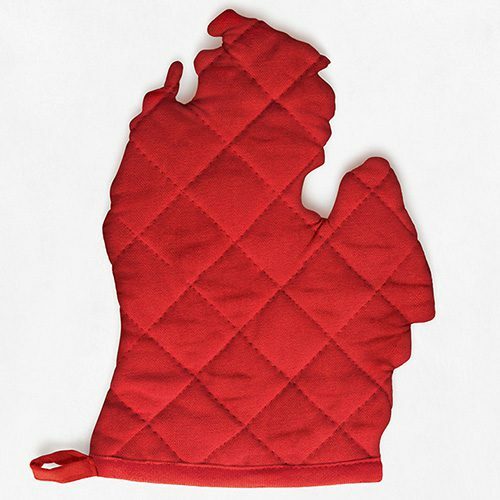 Warm the pan over medium-high heat. 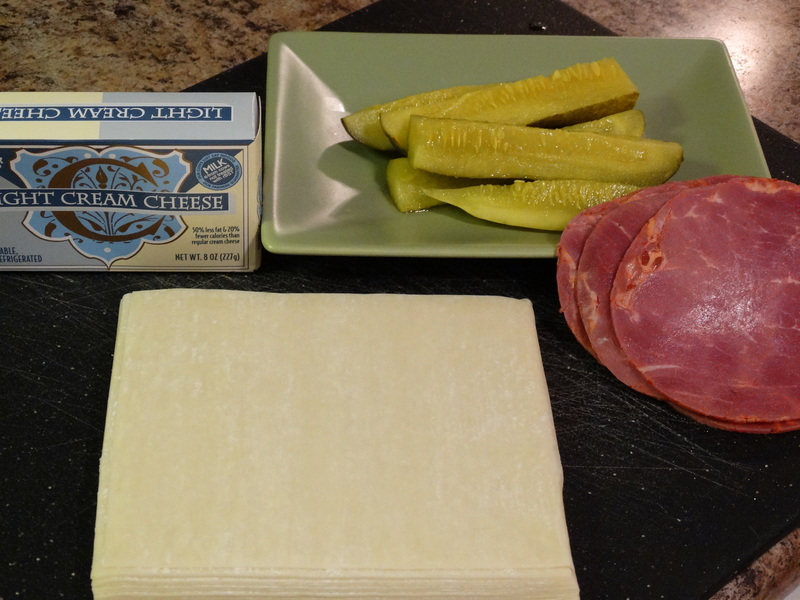 2) Spread a thin layer of cream cheese over a slice of capicola. Add a pickle spear and roll tight. 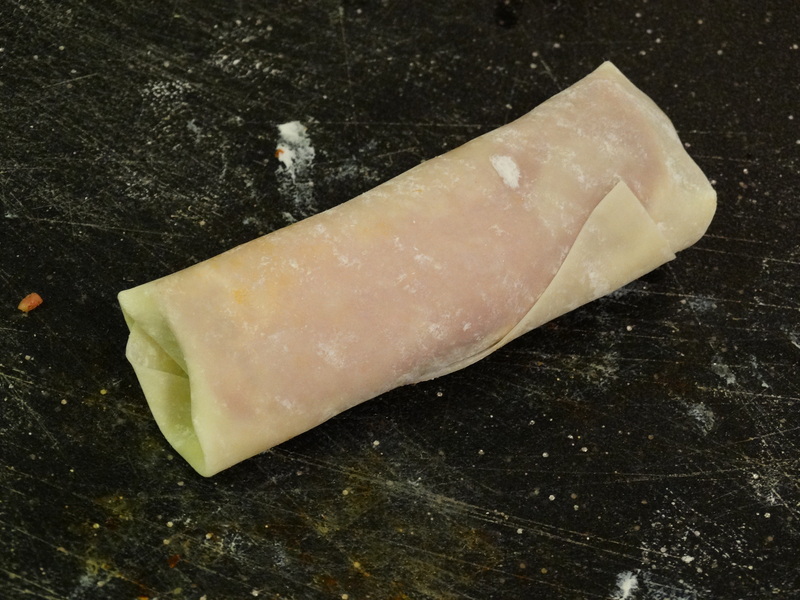 Place your pickle roll on a single egg roll wrapper diagonally. 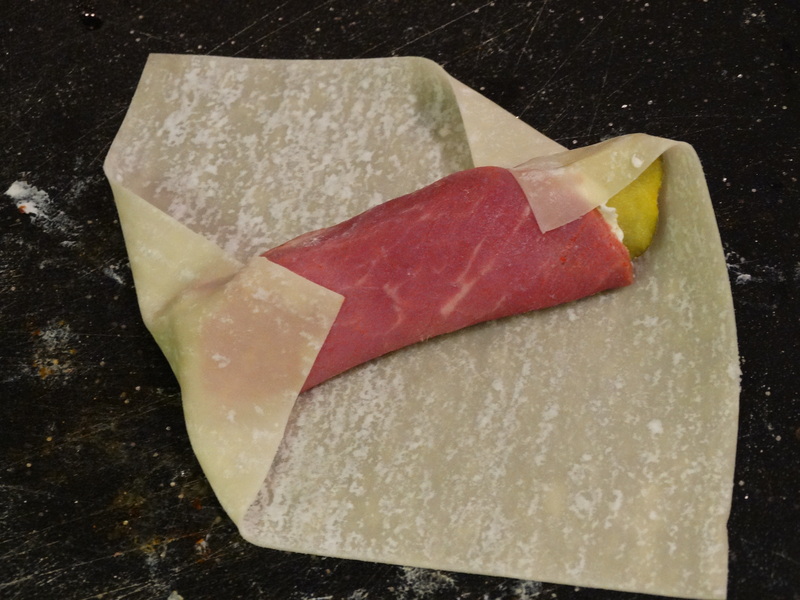 Tuck in the ends, then wrap the sides to form an egg roll. 3) When your oil is hot, add the rolls to your pan leaving space between them. Fry on one side until crisp, then flip and fry the other side. 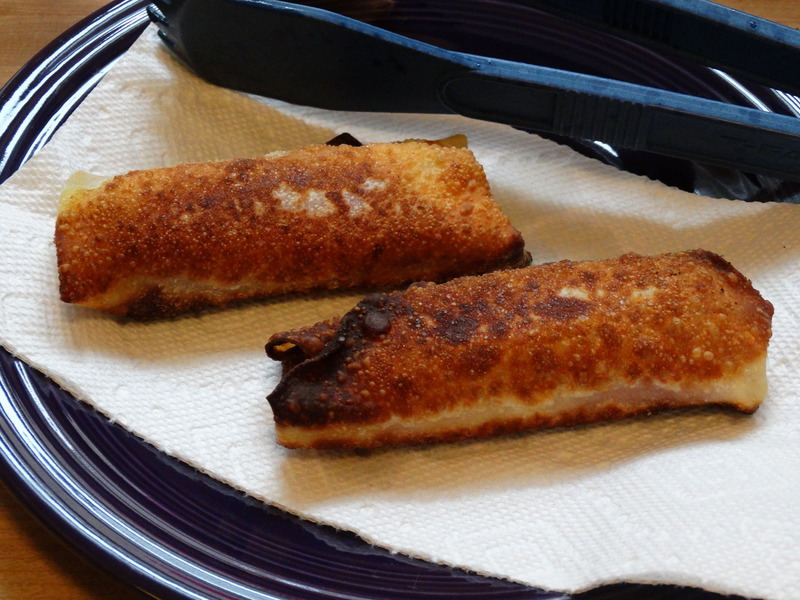 When both sides are brown and crispy, remove the egg rolls from your pan and place them on paper towel to cool. When they are cool enough to handle, slice them in half and serve with your prefer dipping sauce. Enjoy! Stir all of these ingredients together and serve along with your egg rolls. omg I need to make these, they look so good!!!! Thank you! They are DELICIOUS! Enjoy!